Not so long ago, Revs were flown without slack-line tricks. This is no longer the case. One of the problems with slack line tricks on a Rev is the lack of a shaped wing. Many dual-line pilots have a repertoire of tricks which rely on the wing holding its shape during a slack-line move. For example, during a turtle maneuver, the frame keeps the wing in shape. On a Rev, the wing flutters about and the kite doesn’t float reliably, leading to bowties, wing wraps, etc. Some of these problems can be alleviated by using Magic Sticks and trick lines. For those of you unfamiliar with Magic Sticks, they are a pair of add-on sticks that protrude behind the wing. They give the frame a bit of stiffness, but add some weight as well. Trick lines run across the bottom tips, although I have seen them run from the left top to the bottom, across and up to the right top. Personally, I use neither of these. The lack of a shaped wing doesn’t make it impossible to perform these tricks, just more difficult. You have to be more careful and it helps if you have developed some skill in recovering from wing wraps and the like. The most common slack line trick, is the axel. It looks much like the dual line variety, but is executed differently. There are a few varieties of axels, due to the fact that a Rev can hover in nearly any position. You can’t do a “normal” axel in the upright position, as far as I can tell, although if you pancake it, you might. Since an axel is essentially a flat spin, anything that can get you into this will work. I tend to throw one hand out and pop the other. It’s easiest to accomplish from upside down or one of the 45 degree angles. One thing that makes this move easier is a step forward, then a step back (or two or three!) during and after the axel. This gives the kite room to spin, then recover smoothly afterward. A variation on this is the cartwheel (axel from sideways position) and the launch strobe. After mastering this move, you can also do things like coin tosses or waterfalls. Next is the turtle and flik-flak trick variety of tricks. This is where the kite is lying on its back (or front), floating. Again, it is much like the dual-line trick in appearance, but not in execution. This move is executed by popping both bottom lines hard from an upright position. You can also do it by tugging on the bottom lines. I don’t because I want my hands on the handles. This move is tough to get. It’s very easy to miss and wind up in a bowtie. Often the kite just falls out of the sky or one end falls toward you, or it doesn’t flatten out at all, just jumps backward a bit. It’s much easier to do with an SUL, pretty easy with a standard, and tough with a vented. The force you pop with is crucial here, even and just the right amount. Harder and the kite is more likely to flik-flak. Getting out of it is normally a matter of pulling hard on the top lines and backing up a few steps. Stepping forward as you pop the bottom lines can help too. If you can get a good stable float, then maneuvers like fades become possible. I also like the “pancake landing”, in which you do the turtle move at ground level and the kite is on its back on the ground. This move can also be executed sideways. Basically, any position where you can reverse will work. 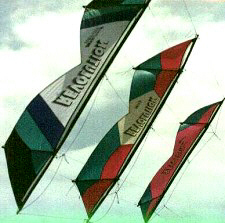 A variation of the turtle is the reverse turtle, where the kite is floating on its front. This one is executed from an upside down position. It’s fairly common among beginners. This entry was posted in 2001, General Topics, Issue 20 (Jan), KL Archive and tagged Axel, flik-flak, revolution, slack-line tricks.